Chronicle debuted at number one at the box office last Friday and is currently enjoying an 85% rating on rottentomatoes.com. It was written by Max Landis (the son of John Landis, director of the Blues Brothers, An American Werewolf in London, and Michael Jackson’s Thriller), who is currently 26 years old. 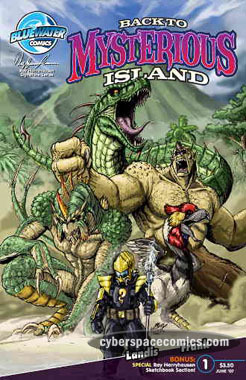 Years prior to this movie’s release (2008, to be exact), he wrote a comic series from Bluewater’s Ray Harryhausen Signature Series called Back to Mysterious Island.